Let’s face it, we all have an inherent sweet tooth ingrained in our lack of free will. We can stay disciplined for a short while, but sooner or later our tongue will be itching for that sweet and delectable treat. So how do we combat this incessant craving? Well, we don’t really have to fight it per se, we just need to be strategic about our sugar-craving tactic. 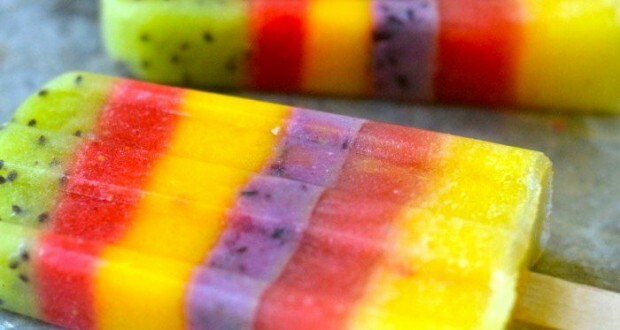 Meet the rainbow whole fruit popsicle. No chemicals, artificial colours, no added sugar of any kind, no other ingredients other than whole fruit, and boy is it a good one. All it requires is a bit of patience, but if you like your sweets, a little wait goes a long way in this case. Enjoy! Can we get a ‘heck yes‘ for esthetics? 1) Working with one fruit at a time, puree in a small food processor. Rinse the machine out between fruits. 2) Carefully spoon a layer of fruit at the bottom of each popsicle mold. Gently rap the mold on a firm surface to level the puree. Freeze until solid. 4) Continue on until you have filled the molds. If any of the purees are a little too thick to work with, stir in a little water. Clean up any spilled puree from the insides of the molds as you go so they won’t mar your design, just scrape the drips down with a popsicle stick. 5) To un-mold, fill your sink with hot tap water, and hold the mold in the water, just up to, but not over the top edge, for a few seconds. If the popsicles don’t slide out, hold the mold in the water a little longer. The fruit amounts are approximate, depending on your mold you may need a little more or a little less. You can always add a little water or yogurt to stretch the amount. My popsicle mold has 10 slots and each slot holds about a 1/2 cup of liquid. This recipe originally appeared on The View From Great Island.